Sign up sheets are now available for your use, but you'll need to edit your privileges first. A checklist is a list of people who all need to do the same thing, like turn in a permission slip. A sign up sheet is a list of a bunch of things that you need volunteers for. Go to Communicate -> Sign Up Sheets. 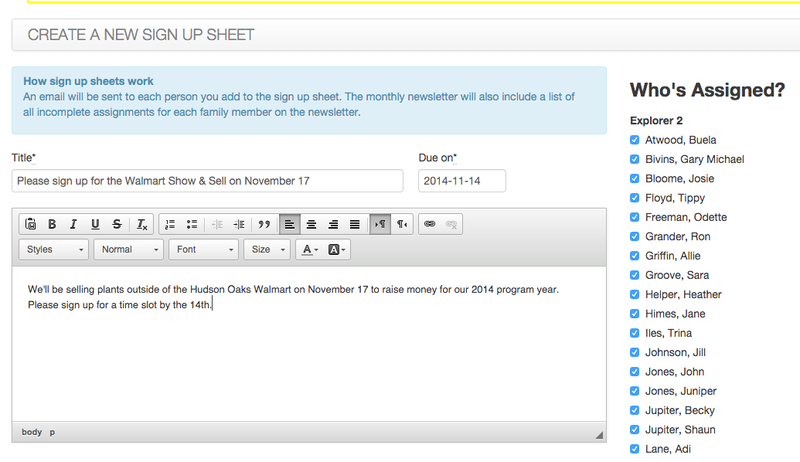 If you don't see that option you will need your privileges updated to include sign up sheets. Everyone you've invited to your sign up sheet will have an assignment listed on their "My Assignments" page until the due date is passed. Once they volunteer for an item, that will also show up on their assignments page. Assignments are also included in the newsletter.